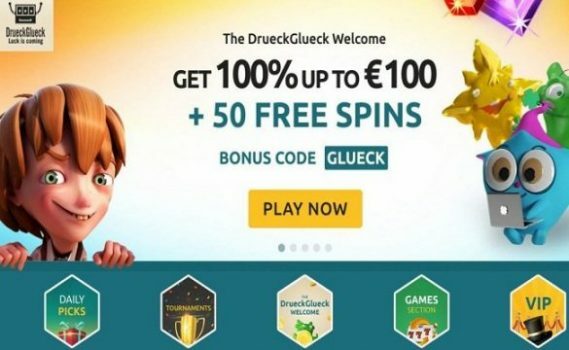 DreuckGlueck casino is becoming one of the most popular online casino site for European, UK and Canadian online casino players. This casino site has everything that a player may need. The casino offers over 900+ different kinds of video slot games, table games, Roulette, Video poker and live casino. This European facing online casino site is powered by software such as WMS, Microgaming, NetEnt, Evolution Gaming, NetxtGen gaming, Barcrest Games, Amaya and many others. DreuckGlueck casino is licensed by some of the major gambling authorities such as Malta gaming Authority, UK Gambling commission and Schleswig Holstein. This casino is also authorized by Government of Denmark. The casino offers a welcome bonus of 100% to up to €100 +50 free spins to every new player signing up and depositing. The casino offers extra free spins to 1 year Monthly rewards are also there on the card while playing with DrueckGlueck Casino. DrueckGlueck casino does not accept players from Australia, Belgium, Cyprus, France, Hungary, Israel, Mexico, Romania, Spain, Turkey and the United States. As mentioned earlier, DrueckGlueck casino offers hundreds of different kinds of video slot games such as Immortal Romance, Book of dead, Viking Runecraft, Foxin wins, Easter Island, Gem Rocks, Thunder Struck, 7 Sins, Tower quest, Orient Express, Vikings Go Wild, Power Plant, Reef Rin, Sea Hunter, The Sand Princess, ELTorero, Amazon Queen, Super Heroes, The Legend of Shangri-La and many others. DrueckGlueck casino also offers table games such as Roulette (European Roulette, French Roulette, Live German Roulette by NetEnt, American Roulette pro, VIP Roulette, Classic, Real King Roulette and many more). The casino also offers lots of card games like (Blackjack, Multi Strike Poker, Blackjack Live, Deuces Wild, Punto banco, Joker Poker, baccarat and many more). The site hosts Real Big jackpots and Live casinos as well. DrueckGlueck casino could b a perfect player if you love to play live casino. The site is perfectly awesome and hosts live casino powered by Evolution gaming. When it comes to mobile casino, DrueckGlueck casino is simply awesome. All the game hosted at this casino site can be enjoyed using mobile phones and platforms such as Android, ioS and Mac. It is very easy to play all these latest online slot games using mobile or smart phones. DrueckGlueck casino has a very credible support system. This casino offers a great customer support to its players. Whether you are looking to contact then using e-mail services or with live chat option, DrueckGlueck casino is always there for you. The executives of this casino are very professional and that means you don’t need to worry about anything or you don’t have to wait for any question that you might have in your mind while playing. DrueckGlueck is one of the latest online casino Europe. The casino was launched in 2015 and since then it is growing very sharply. The site uses latest SSL encryption certificates and hence there it is the safest casino place indeed. The casino is independently tested by RNG iTech Labs, while is one of the leading in marketplace.